Wednesday, August 2, and Thursday, August 4, 8 p.m., SAFEhouse Arts: This will be a program presented by RAW (Resident Artist Workshop), a residency program run by the SAFEhouse for the Performing Arts. The theme of the program will be the human body, and Arina Hunter will present a new solo utilizing her body as the source of all sounds. There will also be a choreographic exploration of the body by Rayla Meshawn, as well as other new work by Hunter and Katarina Countiss. SAFEhouse Arts is located at 1 Grove Street at the corner of Market Street. Admission will be $15. Tickets may be purchased in advance online through Vendini event pages for the Wednesday and Thursday performances. Thursday, August 3, 8 p.m., Luggage Store Gallery: This week the Luggage Store Creative (LSC) Music Series will present two sets of solo improvisations. The first set will be taken by guitarist and vocalist Owen Stewart-Robertson. He will be followed by a solo trumpet improvisation set by Brad Henkel, currently visiting from Germany. The Luggage Store Gallery is at 1007 Market Street, directly across from the Golden Gate Theatre at the corner of Golden Gate Avenue and Taylor Street. As always admission will be on a sliding scale between $6 and $15. Sunday, August 6, 7:30 p.m., The Musicians Union Hall: This will be a double-header week for Outsound Presents, since the LSC gig on Thursday will be followed by the next program in the SIMM (Static Illusion Methodical Madness) Series. This will also be two sets. However, while LSC offerings tend to go for free improvisation at its freest, SIMM offerings generally explore jazz practices that include both composition and improvisation. The opening set will be taken by the Hung Professionals, a trio let by Tom Weeks on alto saxophone with rhythm provided by Nathan Corder on guitar and Scott Siler on drums. For the second set Rent Romus, who runs Outsound, will lead his own Life’s Blood ensemble, paying alto saxophone and flutes. The group will also include Joshua Marshall on tenor saxophone, Heikki Koskinen on flutes and e-trumpet, Safa Shokrai and Max Judelson on bass, and Timothy Orr on percussion. The Musicians Union Hall is located at 116 9th Street, near the corner of Mission Street. Admission is on a sliding scale between $10 and $15. Monday, August 7, 8:30 p.m., Make Out Room: One week from today will be the first Monday of the next month. That makes it is the night of the Monday Make-Out at the Make Out Room, three sets of adventurous jazz that are scheduled for presentation on that monthly occasion. The first set will be a solo by percussionist Jon Arkin, supplementing his instruments with electronics. He will then return in the second set to perform in the modern jazz quartet (note the lower-case letters) IJKL. Those letters are the initials of the four performers, Arkin being the J of the group. The leader is trumpeter Ian Carey. The other letters are accounted for by Kasey Knudsen on saxophone and Lisa Mezzacappa on bass. The final set will be free improvisation by the Brian Pedersen Trio. Pedersen leads on saxophone, joined by Sung Kim on ozukuri, an instrument of his own creation, and Robert Lopez on drums. This afternoon at the Center for New Music (C4NM), Rae Diamond returned with her Long Tone Choir to present a program prepared for the HUSH Series curated by Julia Ogrydziak. This program marked the launch of Ogrydziak’s series. It consisted of a single full-length piece, summer 1: insects, the second of a five-part series of what Diamond calls “performance installations.” Diamond has planned the entire series to explore the cycle of the seasons. This event marked the return of Diamond and her vocalists to C4NM, since they had previously contributed to a performance of Danny Clay’s “Turntable Drawing No. 25” at the beginning of last month. summer 1: insects is an “installation” in a sprit somewhat similar to John Luther Adams’ “Inuksuit,” which was performed yesterday afternoon. However, while Adams’ performers migrate to their respective “stations” and remain there for the duration of the composition, Diamond and her fellow singers migrate from one station to another as the piece unfolds. Each station consists of a sculpture that Diamond designed to suggest (but not explicitly denote) an insect; and hanging from the sculpture is a sheet of instructions to the vocalist. The vocalists migrate from one station to another. There are no constraints on how long they remain at any station. However, once a direction, clockwise or counterclockwise, has been set, all performers must follow the order of the individual stations. Instructions may involve sound qualities, phonemic constraints, or, in two cases, specific words (“summer” and “ice”). The two-hour duration of the piece is marked at the half-way point with an invitation to members of the audience to join the choir; and the program provided a full sheet of instructions (which were not particularly complicated). Ogrydziak conceived of HUSH as an opportunity to present a series of programs, each of which explored one of more aspects of sound as meditation. One could quickly apprehend the meditative qualities of summer 1: insects, as well as the focus that each of the performers brought to following the “rules of execution.” Unfortunately, there was a major disturbance that severely inhibited the ability of the audience to accept the intended meditative qualities. Several photographers had been enlisted to document the occasion; and, while their physical presence was not particularly disruptive, none of them seem to have appreciated that the latest technology advances in digital cameras no longer simulate the noise made by “old-school” physical shutters. Thus, while it was easy enough to settle into Diamond’s particular approach to establishing a rhetoric of quietude, that quietude would be shattered by camera noise right about the time that the listener was buying into the effect Diamond was trying to achieve. As a result, the invitation to participate at the half-way mark felt more than a little questionable. Speaking strictly for myself, had I settled into the environment that Diamond had created during the first hour, I probably would have felt prepared to contribute when called upon to do so. Sadly, the photographers were too successful in undermining my ability to embrace either the theory or the practice behind Diamond’s work. Hopefully, she will be able to perform this piece again in a more conducive setting. 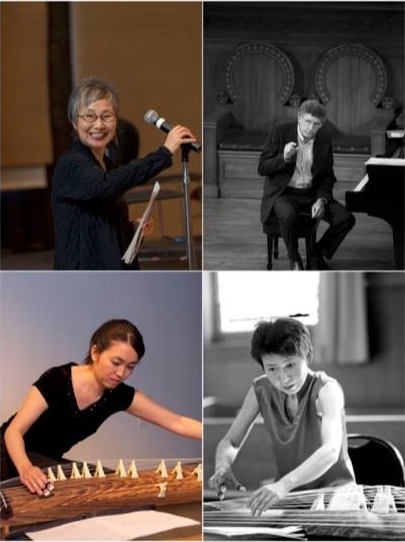 Yang has prepared a program of four works by living women composers, all but one of which have been scored for violin and electronics. The one piece that does not involve electronics will be Shulamit Ran’s “Inscriptions,” which draws upon a wide diversity of playing techniques to establish the impressions of three distinct spaces in time. “Dandelion” was composed by Mary Kouyoumdjian for violinist Andie Tanning Springer; and it uses the interplay with electronics to serve as “commentary” on the standard repertoire. The title of Nina C. Young’s piece, “Sun Propeller,” refers to the appearance of rays of light that appear to come from the sun when light comes through the edges of clouds. The program will conclude with Kaija Saariaho’s “Frises,” which is based on four ostinato patterns frequently employed in Baroque music. This concert will begin at 8 p.m. on Saturday evening, August 26. C4NM is located at 55 Taylor Street, half a block north of where Golden Gate Avenue meets Market Street. Admission will be $15 with a $10 rate for C4NM members. In addition to being sold at the door, tickets will be available in advance online from a Vendini event page. The name of the instrument comes from the Greek κανών (canon), an ancient instrument that inspired Harry Partch to build his Harmonic Canon instruments, which also involve microtonal tuning. Paris’ command of his instrument was impressive, to say the least, all the more so because his repertoire was strictly melodic. He explained to the audience that harmony does not figure in Arabic music. All performance is in unison, including his singing along to his own instrumental accompaniment. Nevertheless, he displayed a keen sense of embellishment; and there was something thoroughly absorbing in the matching of his vocal embellishment to his instrumental technique. In most of his selections he was joined by Briana Di Mara playing a violin with the strings tuned G-D-G-D (a scordatura technique that was explored by Heinrich Ignaz Franz Biber in the seventeenth century). That tuning facilitated her following Paris’ melodic lines, although problems with the amplification equipment tended to mute her success in matching his pitches. The only harmonies of the evening came from David McLean’s flamenco technique on his guitar. The objective of the program seems to have been to explore the origins of flamenco as we now know it, origins that depended heavily on the cultural diversity of the Iberian peninsula under Moorish occupation. McLean was joined by flamenco dancer Kerensa DeMars and, later in the program, flamenco singer Clara Rodriguez. Along with Sage Baggott’s drumming, this amounted to a heady “stew” of cross-cultural influences. Unfortunately, Paris’ efforts to explain some of those influences did not register very well. He, too, had to contend with amplification problems; and his technique of speaking into a microphone could do with some training. He probably would have done better in a more intimate space in which his voice could be heard without electronic assistance. However, the turnout for last night’s concerts was one of the largest that Old First has seen this season; so it is clear that working in a smaller space would have led to considerable disappointment among many. The preferable path would be for Paris to pay a bit more attention to basic showmanship in order that his impressive musical showmanship be better served. Goat Hall Productions is a non-profit 501(c)(3) organization of singers/actors, composers, and writers passionate about contemporary opera and new music theater. The group calls itself “San Francisco Cabaret Opera” because most of its performances are given in an informal setting. Every year it produces a Fresh Voices Festival to showcase new works. 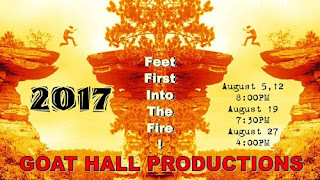 This year will mark the seventeenth annual installment of the Festival, entitled Feet First into the Fire! Thirteen vocalists will participate with piano accompaniment provided by Frank Johnson. The San Francisco performance of this Festival will take place in the CMC Concert Hall. CMC is located in the Mission at 544 Capp Street, between Mission Street and South Van Ness Avenue and between 20th Street and 21st Street. Tickets will be sold at $20 for adults and $15 for students and seniors. There will also be optional cabaret seating for $30. All tickets will be sold at the door. The opening set in the second of the five concerts being presented by the Sixteenth Annual Outsound New Music Summit focused on the free improvisation techniques of Collette McCaslin. Alternating among pocket trumpet, soprano saxophone, and percussion, McCaslin brought together two additional musicians with whom she has accumulated past duo experiences. One of these was Amy Reed, working primarily on guitar and occasionally vocalizing; and the other was percussionist Mark Pino deploying objects that complemented McCaslin’s percussion choices, only one of which involved a drum. On both trumpet and saxophone McCaslin tended to spin out long lines that sounded more like incantation than melody. 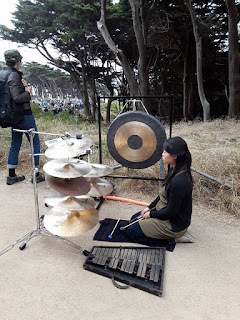 One might almost say that her capacity for free improvisation arises from an almost mystical connection with her instruments (including the percussion at her disposal). In that context both Reed and Pino responded by establishing the environment in which her ritual-like activities could unfold. Reed was particularly imaginative in the ways in which she could use her electric guitar to establish sparse pointillist textures. This amounted to a refreshing change from the accompaniment rhetoric of harmonic progressions, but it also established ground rules according to which microscopic attention was as essential to her background as it was to McCaslin’s foreground. Pino then augmented the background with similar microscopic attention. Each of Tuesday night’s pieces presented by the Usufruct duo tended to unfold over an extended duration, suggesting that the two performers gave equal attention to an overall plan and inventive improvisation within that plan. The pieces in last night’s set were, for the most part, shorter in duration. One might almost say that each was on the scale of a nineteenth-century lyric poem with the trumpet and saxophone evoking a poet’s voice without necessarily homing in on the poem itself. The entire set was relatively low-key and introspective, another way of establishing a complement to Usufruct’s rhetoric. However, if the players themselves were introspective, the music still reached out with its own subtle powers to engage the attentive listener. This month began with a heads-up announcement about Michael Tan’s recital at the Center for New Music (C4NM), which will be taking place at the beginning of next month. Another “forward pass” of a month’s duration involves another piano recital at C4NM that deserves save-the-date recognition. 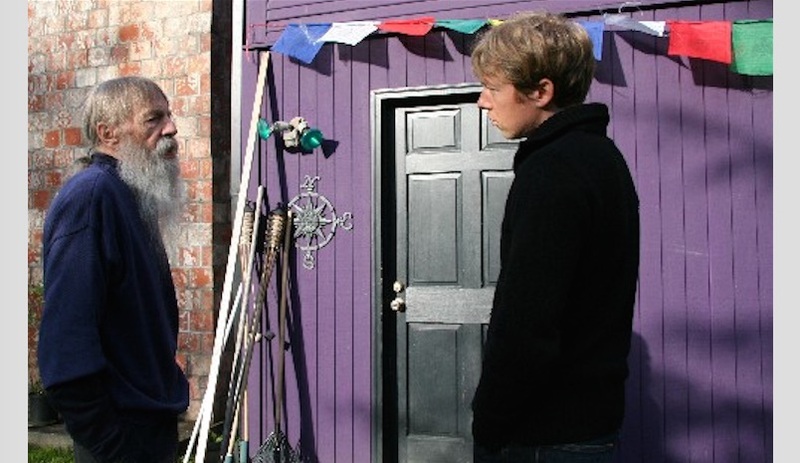 This occasion will be an evening of solo improvisations by Danish pianist Søren Kjærgaard. I first learned about Kjærgaard through the extended twists and turns of the introductory talk that Torben Ulrich gave for his Meridian Music event at the Canessa Gallery in January of 2016. Kjærgaard regards his solo performances as “an artistic research project that looks into solo performance as an expressive format for multi-layered and multi-directional improvisation.” This involves cultivating a solo piano technique that requires the player to participate in feedback processes. Kjærgaard’s work also includes audio-visual documentation, experimenting with different ways of listening and reflecting on the creative process in an attempt to open up new ways of creating real-time feedback as part of performance practice. This concert will begin at 8 p.m. on Wednesday evening, August 23. C4NM is located at 55 Taylor Street, half a block north of where Golden Gate Avenue meets Market Street. Admission will be $15 with a $10 rate for C4NM members. In addition to being sold at the door, tickets will be available in advance online from a Vendini event page. Last night in Old St. Mary’s Cathedral, the Midsummer Mozart Festival presented the only program prepared for its 2017 season. The ensemble consisted of an appropriately reduced string section joined by two oboes (Laura Griffiths and Ruth Stuart) and two horns (Glen Swarts and David Goldklang). In the absence of a conductor, the group was led by Concertmaster Robin Hansen. Hansen was also one of the two soloists in the major work on the program, the K. 364 sinfonia concertante in E-flat major with solo parts for violin and viola. 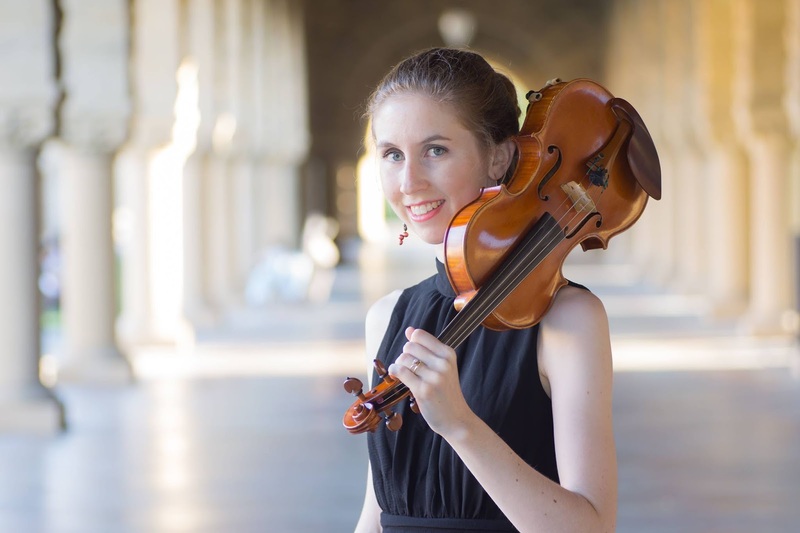 Hansen was joined by Principal Viola Elizabeth Prior. Both Hansen and Prior joined in the ensemble parts when they were not serving as soloists. Old St. Mary’s Cathedral is a rather cavernous space, but its acoustics have a reputation for being conducive to both small ensembles and chamber music. One could thus close one’s eyes to escape the physical properties of the space and appreciate the intimacy of last night’s interpretation of K. 364. This was evident as much from the relationship between ensemble and soloists as it was in the give-and-take of a playful conversation between the two soloists. This was a reading that evoked how the late Director of the Festival, George Cleve, felt the spirit of Mozart should be experienced; and the result was an account of this familiar composition that served both Mozart and Cleve in equal measure. All of the string Principals participated in solo work in the performance of the K. 251 divertimento in D major. The scoring also includes two horns and a single oboe part (Griffiths) with abundant opportunities for solo work. Over the years of Midsummer Mozart seasons and preview concerts at Old St. Mary’s, I have enjoyed a series of opportunities to enjoy Griffiths performing this piece. Her rhetoric has run the gamut from prankish to refined, giving convincing accounts of both extremes. Last night she opted for the latter with an exquisitely polished delivery of the full gamut of solo work allotted to her instrument. Given that Mozart may have written this piece for his sister’s birthday, the prankish approach is definitely justified; but Griffiths’ rhetorical stance definitely fit well into the overall tenor of the evening. Under Hansen’s leadership, the group confidently rose to the challenge that Mozart had set; and, having established the stance that this symphony would take, it pursued the opposition of energy and refinement over the course of all four movements, each of which cast that opposition in a different light. We should all be glad that the Midsummer Mozart Festival is still alive and well, even if it is a bit more modest than it used to be. Yesterday afternoon the Old First Concerts series at Old First Presbyterian Church presented the duo of Korean cellist Sarah Hong and Japanese pianist Makiko Ooka, who perform under the group name Le Due Muse. They were joined by Korean violinist Jiwon Evelyn Kwark. The program consisted of a cello sonata flanked on either side by a piano trio. All of the composers were Russian, and what made this program particularly interesting was that each of the three selections captured a different period in Russian history. The cello sonata was the most recent. 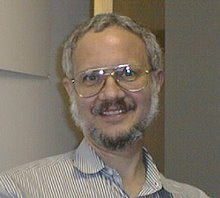 However, the substance of the program can be better appreciated if those periods are considered in chronological order. The earliest work on the program was the first of the two compositions that Sergei Rachmaninoff entitled “Trio élégiaque.” Rachmaninoff was a child prodigy, who began his studies at the Saint Petersburg Conservatory in 1883 at the age of ten. The family moved to Moscow, and Rachmaninoff studied at the Moscow Conservatory between 1885 and 1888. On February 11, 1892, about a month short of his nineteenth birthday, Rachmaninoff performed his first independent concert; and the program included the premiere of his first “Trio élégiaque,” written in the key of G minor. This was a time when Russia was still a monarchy, and organizations like the Moscow Conservatory depended on royals and nobles for support. One of the strongest supporters was the Grand Duke Konstantin Konstantinovich, grandson of Emperor Nicholas I of Russia. The Grand Duke was, himself, a pianist and had been a personal friend of Pyotr Ilyich Tchaikovsky. Whether or not the Grand Duke was in Rachmaninoff’s first audience, the composer certainly knew his influence on standards of taste at the Conservatory; and those standards would have been on his mind when he presented his first original work to the public. The trio was only a single movement, about a quarter hour in duration, coupling a Lento lugubre introduction with a Più vivo main section. Rachmaninoff was clearly more interested in the rhetorical impact of his thematic material than in any of the virtuoso displays for which he would later be better known (if not notorious). Yesterday afternoon’s performance had no trouble maintaining the low-key understatement of that rhetoric, presenting this “beginner’s effort” in the best possible light. The next period in history that figured in the overall program was that of World War II. Dmitri Shostakovich composed his Opus 67 (second) piano trio in E minor in the summer of 1944, a time when Soviet forces had finally overcome the German invasion. Shostakovich had written his Opus 65 (eighth) symphony in C minor about a year earlier; and this is usually taken as his most harrowing response to the conditions of life in wartime. The trio is probably best known for the “Dance of Death” rhetoric of its final (fourth) movement. The principle theme suggests a Jewish melody and may have been an intentional reflection of the Nazi efforts to exterminate Russian Jews. From a technical point of view, the trio is most challenging in its opening measures in which the cello introduces the first theme played entirely with harmonic bowing. Hong rose capably to the demands of this opening passage, which seems to suggest the human spirit pushed up to (if not beyond) the breaking point. This marked the beginning of a journey through emotions that may not have been as dark as those in Opus 65 but were still fiercely intense. From a point of view of overall scope, this was the major work on the program; and all three members of the trio mustered the necessary technical and rhetorical skills to deliver the treatment it deserved. The end of World War II may have meant the end of the Nazis, but it also meant that Joseph Stalin was still the authoritarian power. 1946 was the year of the Zhdanov Doctrine, developed by Andrei Zhdanov, Secretary of the Central Committee of the Communist Party of the Soviet Union. That doctrine was an attack on “Western” influences on the creative arts, condemned as being “formalist.” This was a time when Shostakovich had to hide his compositions in his locked desk drawer, since any thought of performance was out of the question. Nikolai Myaskovsky’s Opus 81 (second) cello sonata in A minor may be one of the better examples of a composer trying to stay on the right side of the Zhdanov Doctrine. The themes that evolve over the course of the sonata’s three movements are easily recognizable, and straightforward melody prevails over both embellishment and development. Nevertheless, it is hard to imagine Stalin having hummed any of these tunes after listening to a performance. (It would probably have been better for all concerned had the music lured him into slumber.) Le Due Muse gave the score an honestly sincere account without overly stressing the dark times under which it had been composed. Holst was one of those British musicians with prolific output and scrupulous discipline. He was content to focus his attention on education and practice and was not prepared for the “smash hit” status of The Planets. If anything, he seemed to regret fame interfering with the day-to-day music activities that he cherished. The fact is that this suite has more than its share of razzle-dazzle effects; and Holst was so focused on pulling so many rabbits out of one hat that larger questions of architecture, both in each movement and over the entire suite, seem to have been neglected. Nevertheless, it is music in which just about every instrument has an opportunity to display its virtues; and Holst managed to embody all of those virtues in a programmatic framework that appealed to popular, rather than merely academic, attention. I had never really appreciated how much detail had gone into this score until I had an opportunity to listen to it being prepared at an open rehearsal at the San Francisco Conservatory of Music. As a result of that experience, I find myself aware of new aspects of the score’s many details each time I have an opportunity to listen to the piece in concert (which is not often). Last night it was clear that Outwater, too, was aware of those details and responded with assiduous care in making sure that every one of them was brought to audience attention. If Holst had the shortcoming of repeating himself too many times, Outwater responded by finding the most appropriate pace for each movement, duly dismissing just about every possible opportunity for tedium to rear its head. Just as impressive was the amount of attention Outwater devoted to Caplet’s orchestration of Debussy. Caplet was a close friend of Debussy’s and clearly had a deep understanding of Debussy’s own compositions. However, it is important to note that, while Caplet probably understood the details of Debussy’s instrumentation techniques as well as Debussy did, he judiciously made sure that his setting of “Clair de lune” departed from just about all of those instrumentation techniques. Instead, Caplet chose his own palette of sonorities, which he felt would best suit Debussy’s thematic material; and the result almost amounts to an original composition in its own right. Under Outwater’s baton SFS revealed the full breadth of Caplet’s imagination, offering a listening experience with as much to discover as any of Holst’s suite movements. The “Song to the Moon” may well be Dvořák’s most compelling piece of solo vocal work. It has a folk-like simplicity on the surface. However, beneath that surface one encounters the complexity of conflicting emotions from which the best fairy tales emerge. As Patricia Racette once observed in a master class, singing in Czech is no easy matter. However, those who know Julie Adams through her work with the San Francisco Opera know that one of her past efforts was the role of the ingenue Kristina in Leoš Janáček’s opera The Makropulos Affair. This translated into a solid command of the text from Dvořák’s libretto and a delivery of this poignant song that went straight to the heart. As was already mentioned, “Short Ride in a Fast Machine” was the down-to-earth introduction to all the cosmic ventures that would follow. This, again, is music in which every note plays a critical role in one detail or another. Most fascinating is how John Adams managed to take gestures that have at least a vague sense of familiarity and warp them with slightly off-beat rhythmic patterns, often superposing several of those patterns. All too often this music is played for the splashy effects of its surface structure. Outwater, on the other hand, clearly understood all of those rich details lying beneath the surface. However familiar this music may have been to many of the audience, last night’s performance disclosed so much that those who thought they knew the piece probably found it a journey of new discoveries. February 11, 3 p.m., James Ehnes: This highly talented violinist made his San Francisco recital debut with CMSF in April of 2012, having made his San Francisco debut with Michael Tilson Thomas (MTT) conducting the San Francisco Symphony (SFS) in June of 2010. Since that time he has returned to Davies Symphony Hall to perform with SFS under both MTT and Charles Dutoit. He has also accumulated an impressive number of recordings involving highly imaginative approaches to both familiar and unfamiliar repertoire. Program details have not yet been announced. February 24, 8 p.m., Michael Schade: This will be a “special project” project that tenor Schade conceived in honor of legendary tenor John McCormack. He has prepared a project (whose details have not yet been announced) that will include arrangements that violinist Fritz Kreisler prepared for recitals he gave with McCormack. Schade’s “channeling” of McCormack will be complemented by Livia Sohn “covering for” Kreisler. March 4, 3 p.m., Seong-Jin Cho: This award winning young South Korean pianist made his San Francisco debut as a CMSF recitalist at the end of this past February. The only composer he will revisit from last season’s recital will be Frédéric Chopin, this time playing the Opus 58 (third) sonata in B minor at the conclusion of his program. He will begin with two sonatas by Ludwig van Beethoven, Opus 13 (“Pathétique”) in C minor and Opus 109 in E major. Between his Beethoven and Chopin sonatas, Cho will play selections from the two books of solo piano compositions that Claude Debussy entitled Images. March 11, 3 p.m., Angela Hewitt: This pianist, who visits the Bay Area regularly, will give a performance of Johann Sebastian Bach’s BWV 988 set of 30 (“Goldberg”) variations on an aria theme. March 17, 8 p.m., Israeli Chamber Project: This ensemble is based in both Israel and New York. It has previously performed in San Francisco under the auspices of the Morrison Artists Series. It amounts to a “string quartet++” group, where those plus signs will best be represented by a performance of Maurice Ravel’s coupling of Introduction and Allegro movements scored for flute, clarinet, harp, and strings. The group also includes a pianist, who will participate in a performance of Robert Schumann’s Opus 44 piano quintet in E-flat major. The program will also include solo piano music by Schumann, Johannes Brahms, and Igor Stravinsky. April 15, 3 p.m., Artemis Quartet: This Berlin-based string quartet will take a meat-and-potatoes approach to their program. They will conclude with the first (in A minor) of Schumann’s Opus 41 string quartets. Schumann will be approached in chronological order, beginning with Wolfgang Amadeus Mozart’s K. 590 quartet in F major, followed by the third (in D major) of Beethoven’s (“early”) Opus 18 quartets. April 22, 3 p.m., Midori: Violinist Midori Gotō is a Bay Area favorite. She has an impressively wide interest in repertoire. In past visits she has given both solo performances and appeared with accompaniment. She has not yet announced the program she has prepared for CMSF. May 5, 8 p.m., Yeol Eum Son: This medal-winning Korean pianist will be making her San Francisco debut. She has prepared a program that will definitely have the broadest scope of the CMSF season. At one end she will begin with Mozart’s K. 264 set of nine variations in C major on “Lison dormait,” an arietta from one of Nicolas Dezède’s comic operas. On the much more recent side she will play both Arvo Pärt’s “Variations for the Healing of Arinushka” and selections from Friedrich Gulda’s suite Play Piano Play, discussed on this site a little over a month ago. May 13, 3 p.m., Brandenburg Concertos: This will be the annual Mother’s Day concert presented by the Archetti Baroque String Ensemble. This group presents historically-informed performances of music from the Baroque period with particular attention to Bach. Every year at least one of the six “Brandenburg” concertos is included on the program. May 20, 3 p.m., Alexander Gavrylyuk: The season will conclude with the San Francisco debut of this medal-winning Ukrainian pianist. The scope of his program will range from the Hoboken XVI/32 sonata by Joseph Haydn in B minor to selections by Sergei Rachmaninoff. He will also play Ferruccio Busoni’s arrangement of Bach’s organ masterpiece, the BWV 565 toccata and fugue in D minor. I have not been able to find a site on the Web on which one can provide the solution to this puzzle. However, once the order has been placed, it should be possible to phone in the solution to 415-759-1756. One may also purchase subscriptions through this number, rather than ordering online. The Early Bird offer will expire on September 1, and single tickets will not be available until January 1. Last night in the Concert Hall of the San Francisco Conservatory of Music, the first full-length fully-staged production in the 60th anniversary season of the Merola Opera Program was given the first of two performances. The program was a triple bill of one-act operas, each involving only three characters. The result was an opportunity to appreciate extended passages of deft solo and duo work by selected Merolini. These opportunities were relatively evenly distributed across three highly varied selections, Giovanni Battista Pergolesi’s “La serva padrona” (the servant mistress), Gustav Holst’s Mahabharata-based “Savitri,” and William Walton’s “The Bear,” based on a play of the same title by Anton Chekhov. Matters were not helped by the decision of Director Peter Kazaras to pay more attention to the mimed role of the servant Vespone (bass-baritone David Weigel) than to exploring different ways to use the da capo structure to flesh out the personalities of the leading roles. Vespone came across as sort of an early ancestor of Harpo Marx; and, to his credit, Weigel’s mime technique was irresistible. Indeed, it was so irresistible that it frequently felt as if Kazaras was frustrated that both Serpina and Uberto kept getting in the way of his contrivances. Holst’s opera fared much better. The narrative involves the young wife Savitri (soprano Kelsea Webb) outwitting Yama, the god of Death (Weigel, singing this time), to save the life of her husband Satyavan (tenor Addison Marlor). Kazaras used both the program book and the projected titles to establish a relationship between this narrative and the tremendous number of British casualties that arose from the Battle of the Somme during the First World War. Visually, the action was translated from the mythic world of Mahabharata to an English country house. (Think Brideshead.) While Kazaras’ concept was ingenious, the extended opening in silence depicting Savitri writing at a vast table did little to establish her character. Ultimately, both male roles were much more sharply conceived and rendered, which sadly blunted the reason why Savitri’s character was strong enough to challenge Death and prevail. Weigel’s depiction of Death was the more compelling, even if he had more than a little trouble maintaining pitch in his opening a cappella solo. Where “The Bear” was concerned, problems began with the opera itself. Working with Paul Dehn, Walton conceived a libretto which repeated itself far too often. The result was a sad disservice to Chekhov, whose original narrative was so compact that it fit both neatly and effectively into a half-hour episode of Have Gun – Will Travel (complete with commercial interruptions). Conceivably, Kazaras could have compensated for the text’s shortcomings by fleshing out the intersecting trajectories of the title character (Smirnov, sung by bass-baritone Cody Quattlebaum) and the “eternal widow” Popova (mezzo Ashley Dixon) with a bit of variety in the details. Both of these vocalists were impressive, but there was a limit to how many times one could sit through their exercising the same schtick over and over again.